In the last two decades, many areas of the social sciences have embraced an ‘experimentalist turn’. It is well known for instance that experiments are a key ingredient in the emergence of behavioral economics, but they are also increasingly popular in sociology, political science, planning, and in architecture (see McDermott 2002). It seems that the potential advantages of experiments are better appreciated today than they were in the past. But the turn towards experimentalism is not without its critics. In her passionate plea for more experimentation in political science for instance, McDermott (2002: 42) observes how many political scientists are hesitant: they are more interested in large-scale multiple regression work, lack training in experimentation, do not see how experiments could fit into a broader research strategy, and alternative movements in political science (such as constructivists and postmodernists) consider that experimental work is not able to capture complexities and nuances. Representing some of these criticisms, Howe (2004) suggests that experimentation is being oversold and highlights various complications, especially the trade-offs that exist between internal and external validity, the fact that causal inferences can be generated using many other research methods, and the difficulty of comparing governance interventions to new medications in medicine. Even if McDermott (2002) and Howe completely disagree on the potential of experiments, they do agree that experiments should mainly be seen as a research method. But this is clearly not the only way in which experiments are viewed in practice; indeed there are many signs that the experimentalist turn is restricted to issues of methodology. Far from it. In an influential overview of the experimentalist turn in a range of disciplines, Ansell and Bartenberger (2016) suggest that the term experiment denotes a range of forms and activities. It is, for example, being used to refer to the design and evaluation of institutional arrangements, to the encouragement of social and political learning, and to the triggering of innovations and transitions (ibid. : 64). In other words, experimentalism is being actively equated with a distinct approach to governing, including but not limited to public policy. This change in conceptualization is one reason why it could be interesting, also for policy scientists, to engage with the experimentalist turn, and this is exactly the purpose of this special issue. Our main goal is to identify the scope for mutual learning, between this turn and the policy sciences. What new insights, for example, does the new work on experimentation offer to those in the policy sciences who have been wrestling with experimentation for many years, even decades? And just as importantly, what can policy scientists add to the new experimentalist literature with respect to core concepts, methods, theoretical insights and empirical findings? In this introductory paper, we seek to address these questions by exploring experimentation in relation to climate governance. This provides a good opportunity to showcase new experimentalist turn in action, in its various shapes and forms. Why this particular case? There is probably no field where the impact of the experimentalist turn has been greater than that of sustainability studies, of which the discussion on climate governance is but one part. At least two leading current approaches—transitions management (see for instance Voß et al. 2009; Berkhout et al. 2010) and adaptive co-management (see for instance Huitema et al. 2009)—regard experimentation as being foundational. Both treat experiments as the starting point (or seed) for desirable societal transformations (for an overview, see Den Uyl 2014). And in more specific discussions on how to govern climate change, experimentation is increasingly mentioned as a critical part of the way forward (see for instance Hildén et al. 2017). The past decade has seen a steep increase in the adoption and implementation of measures—in the public and private realms, nationally and internationally (Bulkeley et al. 2012; Dubash et al. 2013). Since agreement at the global level has often proven to be elusive, hopes are increasingly pinned on initiatives at lower jurisdictional levels, on public–private partnerships, on NGOs and other societal actors, and on business-to-business initiatives. Such initiatives are widely seen as experiments (see for instance Hoffmann 2011; Bulkeley et al. 2014; Evans and Karvonen 2014; McGuirk et al. 2015) in a broader governance system that is considerably more polycentric (Jordan et al. 2018). It is said that these experiments are mainly about achieving practical results, but that they nevertheless also “generate moments in which [past] logics are laid bare for contestation and thus, constitute opportunities for the construction of more progressive outcomes” (Bulkeley et al. 2014: 1484). Indeed, some suggest that they may have even wider “catalytic” impacts (Hoffmann 2011), as it is hoped that under certain circumstances they create a bandwagon effect. We identify four topics around which a new, more cross disciplinary debate about experimentation could be organized. The first is crucial and in many ways foundational: the meaning of core concepts. At the moment, there is a marked lack of conceptual clarity in the various debates about experimentation. In fact, the term experiment is sometimes used so loosely that anything that deviates from normality—however defined—is assumed to qualify as ‘an experiment’. But, to paraphrase Wildavsky (1979), if everything is an experiment, then maybe nothing is an experiment. To avoid concept stretching, the term should be bounded, and consequences for a more collaborative, interdisciplinary forms of research should be thought through. The second topic is to do with the political dynamics surrounding experimentation. In theory, a wide array of ideas can be tested in policy experiments, but in reality this does not always occur (see Hoffmann 2011). Experiments are not necessarily born equal; they may affect target groups in different ways. Some actors may reap considerable benefits, but others may bear considerable costs (see for instance Castán Broto and Bulkeley 2013). There is a realization that experimentation is not a neutral activity, but since the overall emphasis is on (any) action outside the domain of the state (where any action in relation to governing climate change is sometimes perceived as better than international gridlock), the political dynamics of experiments are all too easily assumed away (as already observed by Hoffmann 2011: 156). Paying attention to the objectives behind experiments and/or levels of agreement on the subject of experimentation is thus necessary. The third topic is the way experiments are governed to produce policy-relevant evidence. Experiments are obviously an embodiment of a new idea, but it is worthwhile analyzing who gets to formulate the ideas, who is involved in producing the evidence on their efficacy, which kinds of information should be collected, and which rules of evidence are used. Many politically consequential matters lurk below the surface, for instance, whether one can speak of credible experimental outcomes only when independent scientists are present to evaluate the experiment or not, or whether one can enhance the legitimacy of experiments and their outcomes when their boundary rules are open and many parties can co-experiment. The fourth and final topic relates to what experiments produce by way of policy-relevant learning and ultimately policy change. Ansell and Bartenberger (2016: 70) suggest that the desire to learn is what unites all understandings of experimentation. They suggest that two types of learning dominate: epistemic learning, which is about the scientific understanding of the world, and political learning, which is about changes in the preferences, goals, and commitments of stakeholders. But in the current debates on experiments in sustainability studies at least, learning from experiments is often taken for granted (McFadgen and Huitema 2017), when in reality experimental evidence may only be one consideration for decision makers. Understanding such effects would probably require a better understanding of the way in which experiments are (strategically) used in the diffusion and evaluation of policy inventions (Jordan and Huitema 2014), although the policy entrepreneurship literature does contain some pointers to the role of “success stories” (see, e.g., Huitema and Meijerink 2009). Our exploration of these four topics starts in “Experimentation in the social sciences, with a special consideration of the policy sciences”, where we explore the concept of experimentation in the social sciences in general and the policy sciences in particular. 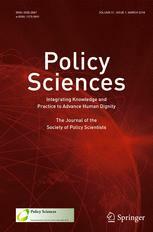 We show that it is still a niche topic in the policy sciences, but one that nevertheless has considerable lineage. We confirm that several policy-relevant interpretations exist, ranging from those that are quite exclusive (essentially a research method) to those that are much inclusive, touching on much broader issues of governance. We think that the policy sciences have a great deal to add to and take from debating this topic. Then, we run through the other three topics—political dynamics, governance and effects—and subject them to similar scrutiny, our aim was to identify the main zones of agreement and disagreement and related to that the scope for bringing in the policy sciences. In “Experimentation: new and emerging perspectives”, we discuss what the papers contribute to our understanding of the four topics. We conclude with a number of suggestions on how to develop a new, more coherent and hopefully more cumulative program of work which draws more fully on policy science insights, and which advances our collective understanding of experimentation in social systems.